The photos we take are extremely personal and tell a story. What a beautiful gift to give someone a picture card that is both personal and visually pleasing. For this card I printed out a photo I took with instagram and added a greeting "aloha" to match the scene in the picture. Hi There! 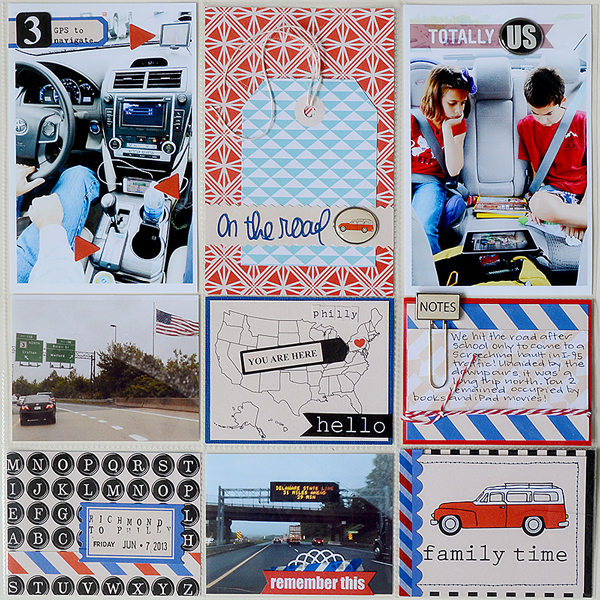 Rochelle again closing out the month with a travel layout with lots of photos! I take so many photos while on vacation it’s so hard to scrap them all. For this layout I wanted to use multi photos but not have the layout photo heavy. To do this, I printed 4 photos a little bit smaller than a 2x3 to fit across the page. I use the beautiful shades of blue and orange from the SunKissed Collection to highlight the ocean and my clothing from the photos. I also added stitching and twine to add dimension to my layout. 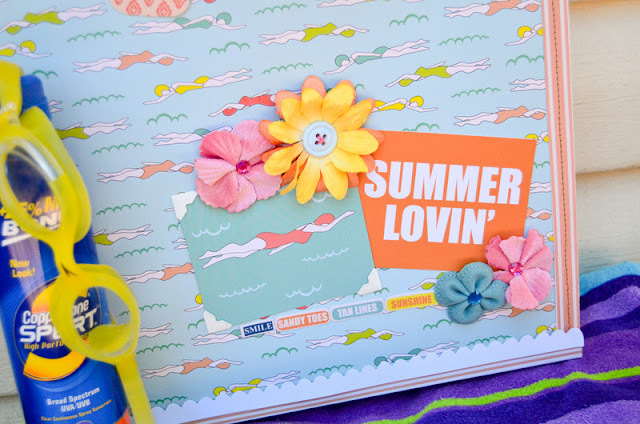 Supplies: GCD Studios SunKissed Collection - Patterned Papers: Weekend Adventures (#2062), Sassy Swimmers (#2057); Swim Lessons (#2060), Pretty Swimsuit (#2061), Tickled with Sunshine (#2065), Lazy Days (#2067); Paperclips (#2035); Label Stickers (#2033); Die-Cut Borders (#2036); Alpha Stickers (#2032); Glitter Epoxy Dots (Kathy Davis Happiness Collection #1868); Other: mini alphas, staple and date stamp. Doesn't that sound fun? Summertime is the perfect time to gather up your besties and head out on an adventure!! 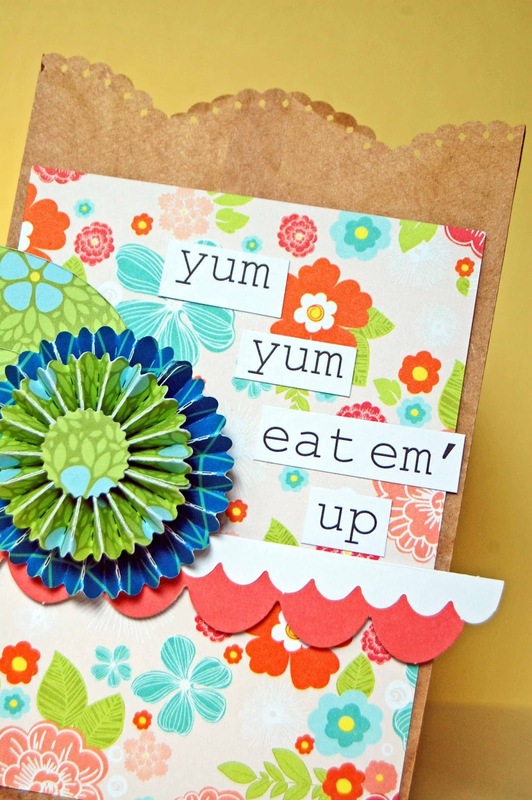 And I have the perfect card for you to create to invite them to come along! 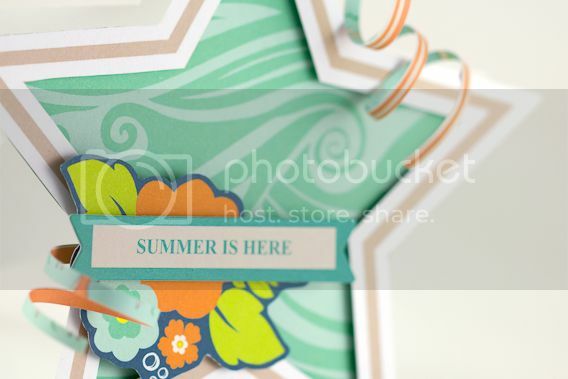 The colors, patterns and elements in the Sunkissed collection made it super easy to create my card. 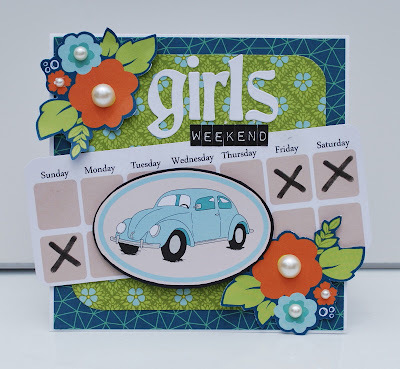 I started with the appropriately named "Weekend Adventures" for the card base. I then trimmed a strip from the "Calendar Girl" paper and marked "x's" with a marker to indicate the weekend of fun. I adhered the calendar strip on an angle for interest. Next, I added some white alpha stickers from the Sunkissed collection and added some mini black stickers to finish the sentiment. 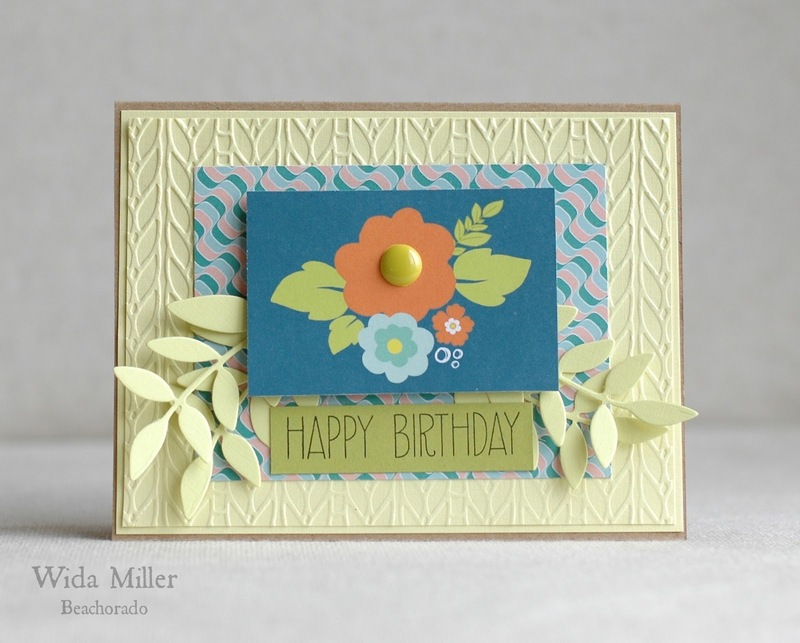 I just fell in love with the cluster of flowers, so I fussy cut them from the paper and adhered them to the corners of the card with foam tape. 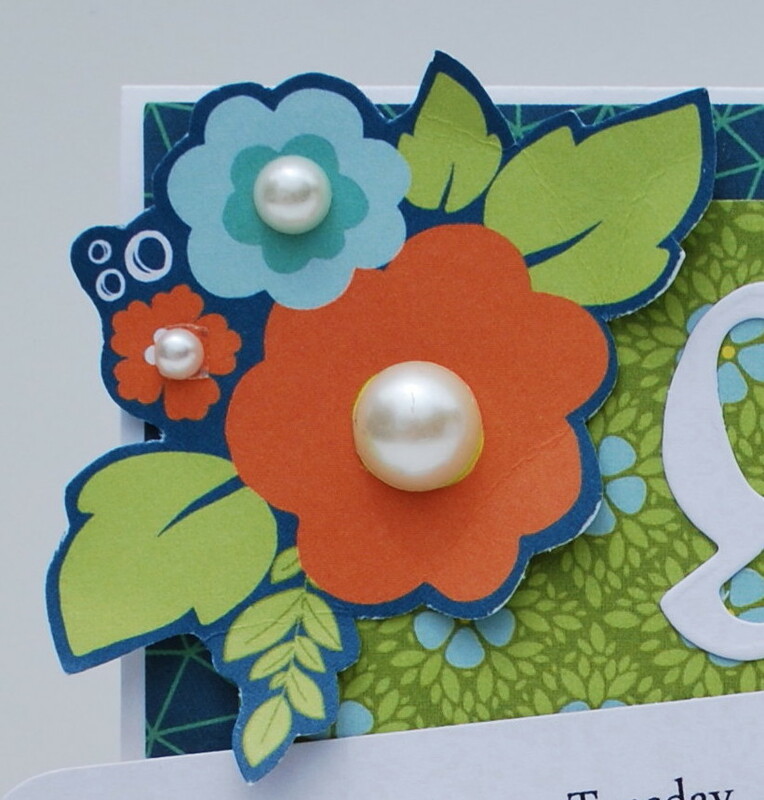 I added pearls to the flower centers for a sweet, feminine touch. And finally, I added the car sticker to finish the card. Here's a tip: I like to adhere stickers to cardstock first, then fussy cut them out so that I can adhere them to my cards with foam tape for dimension. And in this case, I also outlined the sticker with a black paint pen to provided added depth/dimension to the sticker. Thanks for stopping by today! 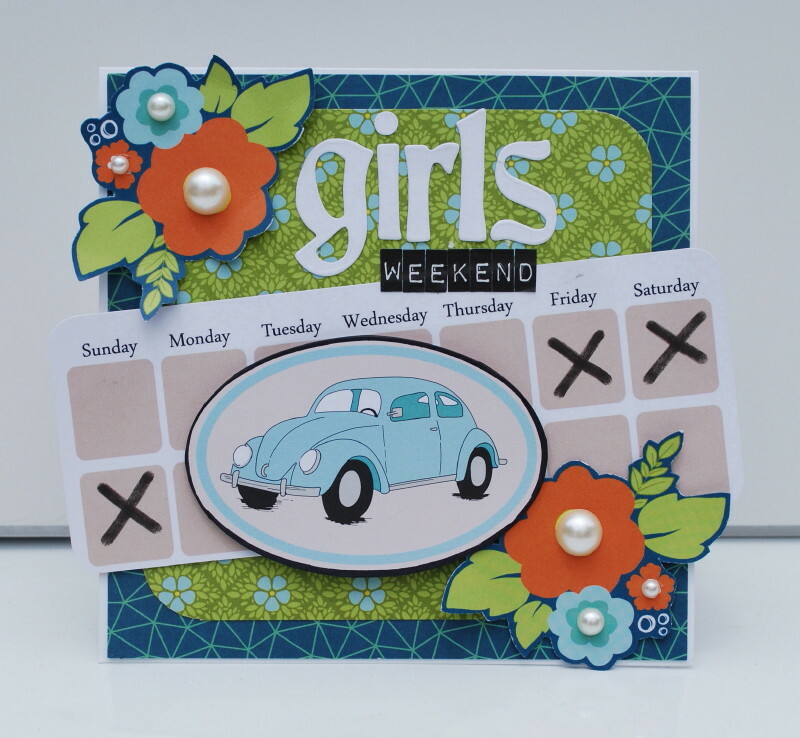 Hope you enjoyed my 'girls weekend' card!! Suzanna here to share with you a layout about travel. We travel a lot as a family: by car, by plane, by foot. Not much by boat but we have done that. My kids are seasoned travelers, thank goodness. We drive a fair amount. It's easier to haul the comforts of home with us. 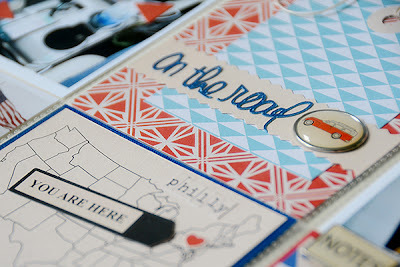 Heidi's Special Delivery collection is a fantastic color scheme and theme for a road trip. Done here in Project Life style. 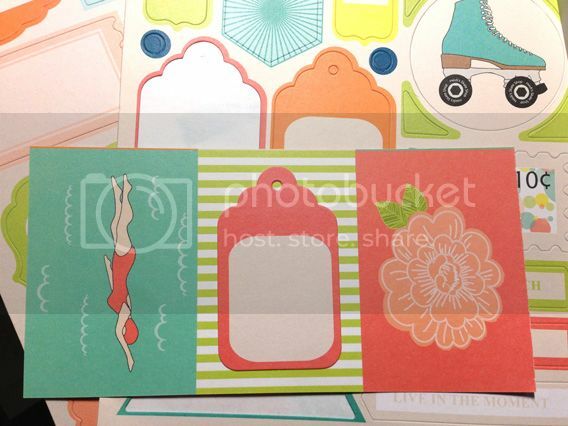 The journal cards aren't quite 3x4 so I backed each one with cardstock or coordinating patterned paper. Each card reflects the theme of the layout is it's own way. I just love that little map of the US. 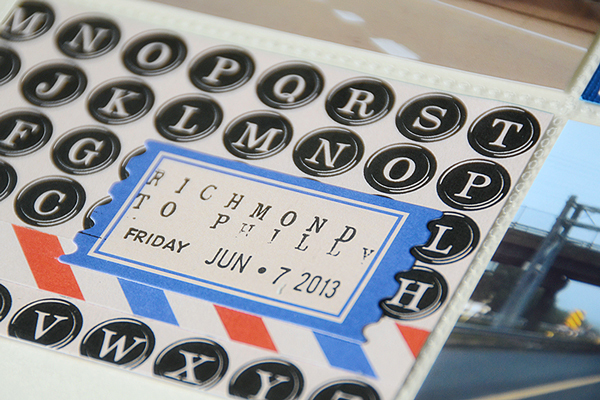 Originally I was going to hand stitch the route from Virginia to Pennsylvania but there wasn't much to stitch. I thought the little hearts from one of the patterned papers would be a cute way to "locate" where we drove to. 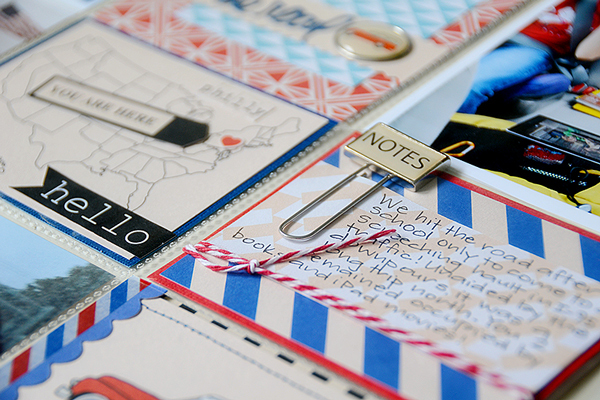 The paperclip makes a fun embellishment for the journaling spot. 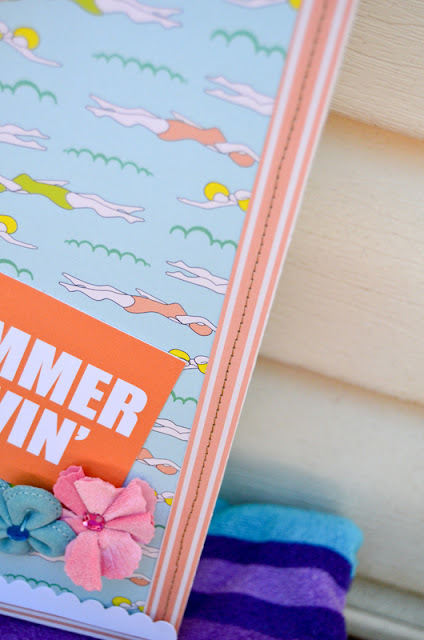 The sentiment that was on the original spot didn't work for me so I covered it up with another piece of patterned paper with a subtle pattern suitable to write on top of. I came into the whole Project Life thing a little late and really am overwhelmed at the whole idea of documenting every day of my life. But that doesn't mean I can't still use the format in a manner that is fitting to the way I scrapbook and remember our journey. Yum Yum Eat Em' UP! Good morning! 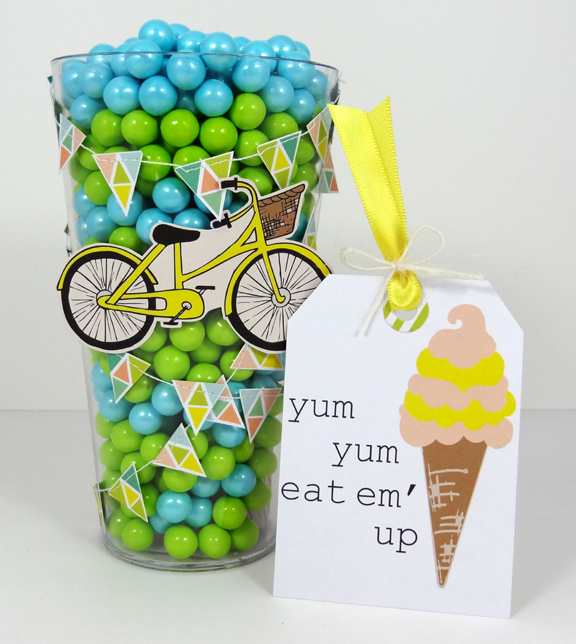 Amanda here today with a fun and easy way to decorate a cup of candy. I love giving gifts of candy. They are inexpensive, easy to put together, and very well-received. 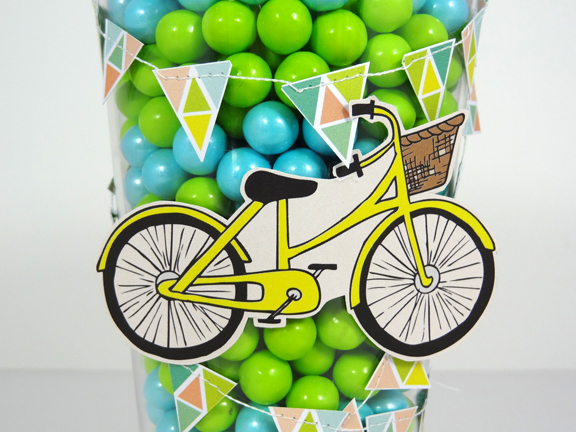 The cup decor is simple--a triangle banner and a bicycle. Doesn't the candy make it look delish? 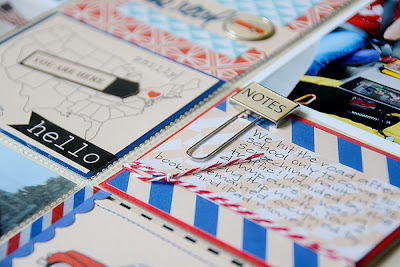 I created a coordinating tag by trimming and punching a journaling card. Yum! 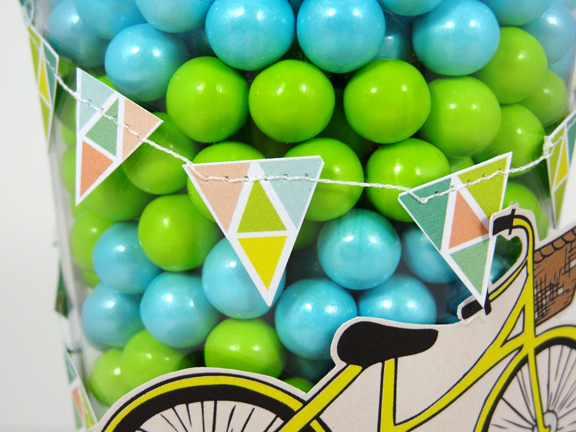 Isn't that little bicycle the cutest? 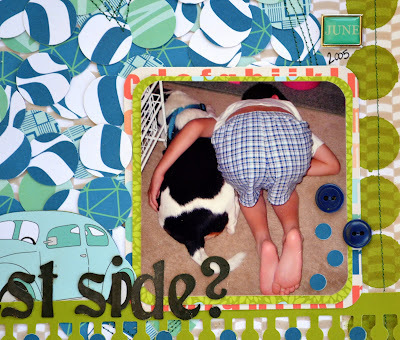 I fussy cut it from a journaling card on one of the 12x12 prints. 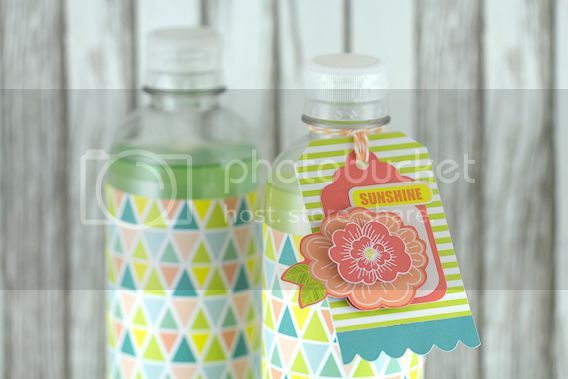 The bright yellow makes it perfect for a summertime gift. 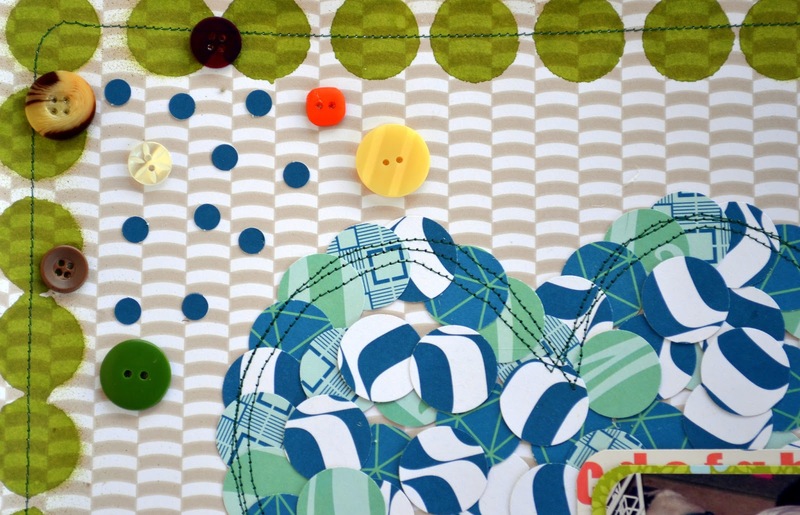 I made the banner by cutting triangles from patterned paper and stitching them together. I attached the banner to the cup with a couple of well placed glue dots. Hope you are having a fun and happy summer! Hello everyone! Nina here with a fun soda tag for the treat week! All paper from Sunkissed 6x6 paper pad #2069; flower, tag and sentiment stickers from Sunkissed Labels #2071; blue border from Sunkissed Borders #2074. 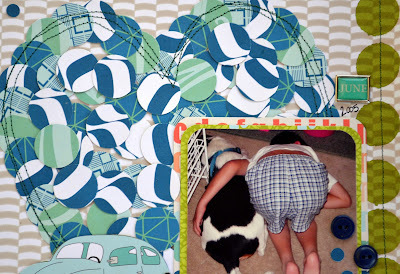 I started with a tag sticker and a cool strip pattern from the 6x6 pad. 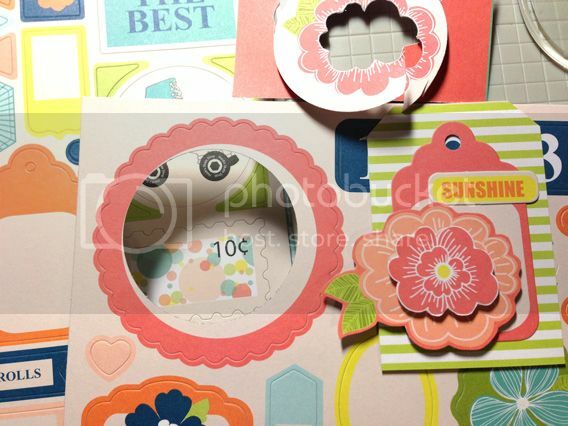 I cut out the flower on the right, punched out another flower from the circle sticker and cut out the center to stack them together for a dimensional look. 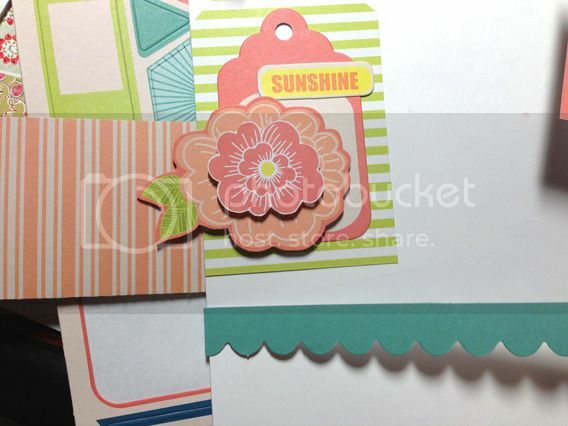 I then backed the tag with some white cardstock, adhered the border and cut out. I am amazed at the many things we can create with paper. The possibilities are endless. Since it’s the summer month, I decided to push the envelope a little and try to create a beach bag from paper. I’ve sewn bags before so I used that experience to put this project together. I made a few changes since the paper cannot be turned over after stitching and at the end, I found that nothing is impossible with paper and a dose of the right inspiration. 1. Cut a 3” wide strip from 12x12 paper. Score the two long ends on the ½” marks and fold. Repeat the process on another strip. 2. 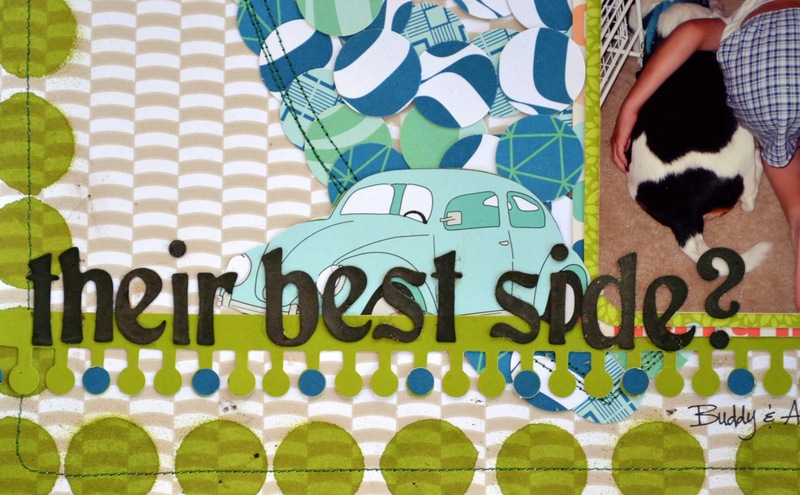 Sew the strips on two 12x12 sheets of identical papers. 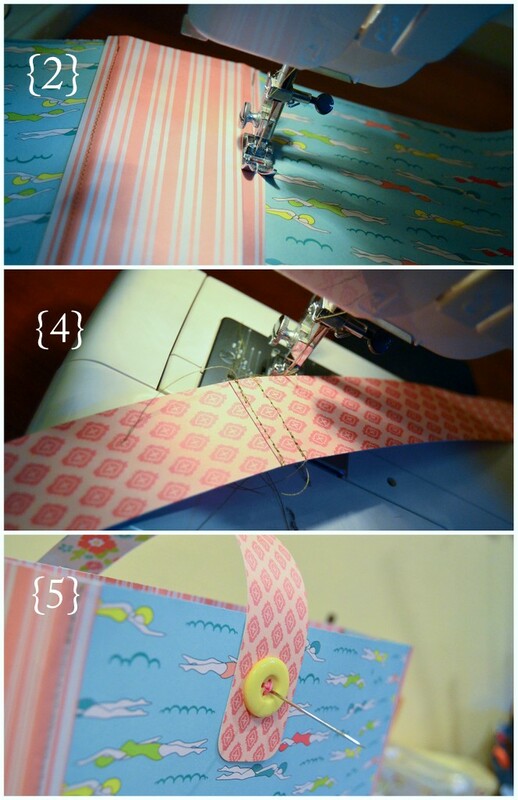 To connect all strips, sew a stitch on the last fold and then adhere the edge to the paper. *Since this is paper and cannot be turned over to its right side so you will create the look of sewn edges without actually sewing the last strip to the bag. 3. Cut another 3” wide strip and score the long ends on the ½” marks. Add adhesive to the folded parts and adhere on the bottom of the bag. 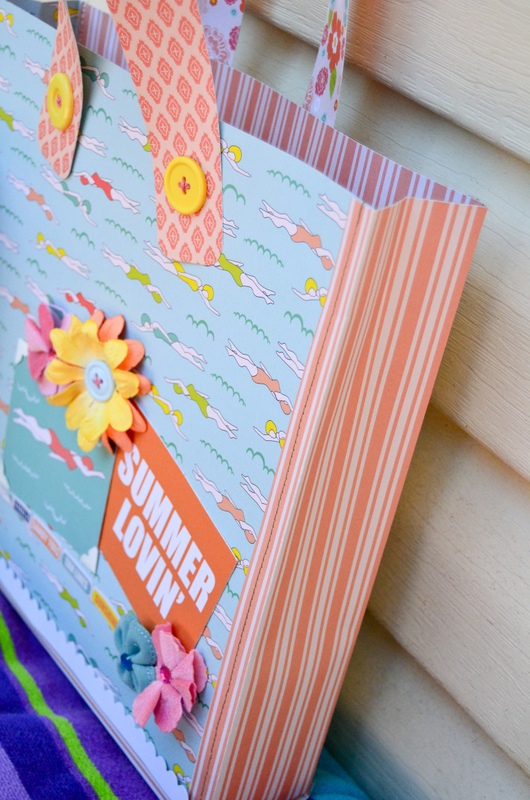 Add a die cut border on the front side of the bag. 4. Cut 4 1 ½” strips from 12x12 paper. Score the one of the strips on the ½” mark, fold and overlap two together. Connect the strips with some machine stitch. Repeat the same process on the other two strips to create handles. 5. Round corners of the handles and place on the top center of the bag. Attach some big buttons on both ends with embroidery floss. 6. 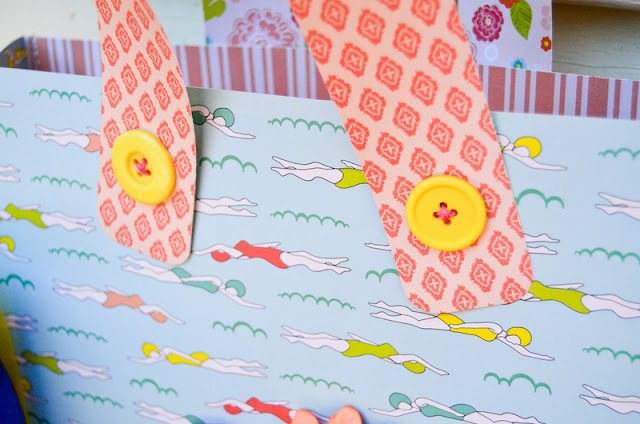 Decorate the front of the bag with paper, flowers and stickers. *This bag is for decorative purposes only. Using it near or in water will damage the bag. Here are some close up look at the finished project..
Hi everyone! Julie with you here today sharing a layout I made with the fun fun fun Sunkissed Collection! Recently I read a book called, "The Dog Lived, and So Will I" - and it was about a woman who's Beagle Dog survived cancer, and then soon after he had been gone through his cancer treatments, she developed Breast Cancer - and she focused how she was determined to beat cancer, because if her dog could live, so would she. It was an inspiring book, and I just loved her attitude and humor. One morning, once I got Adam up, he flopped onto the bedroom floor and laid down next to Buddy and I just COULDN'T resist this photo op! LOL! The alphas in this collection are white, and I was afraid they wouldn't show very well on the background paper I used, so I used some dark brown colored mist and 'colored' them darker to make sure they showed up on my page! I love gift giving and I love making gift bags! 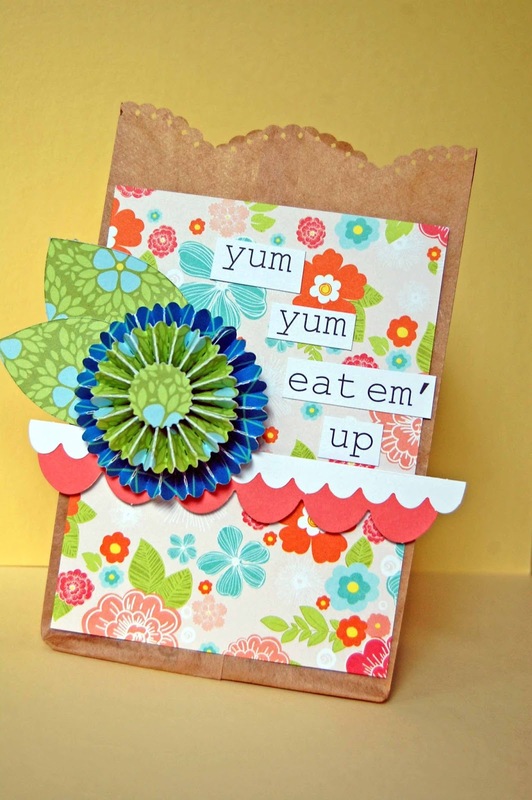 One of the best gift bags to decorate are lunch sacks! Yup those little bags your mom packed your PB&J in are so easy to create with! One of the best features about these bags are when they are folded flat you can use a boarder punch on the top and it cuts all the way through so its a nice even punch! 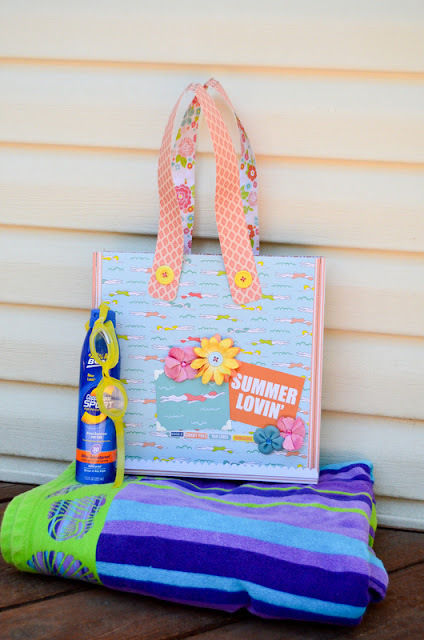 I used the Sun Kissed Collection from GCD Studios to decorate this bag! I created the cute little flower from a fan fold die and it was the perfect embellishment next to my 'yum, yum, eat up' up' sentiment! This was simple to make but it will surly brighten someones day when its filled with home made cookies! Hi my name is Christine and I am addicted to border strips. There, I said it, and I feel better! 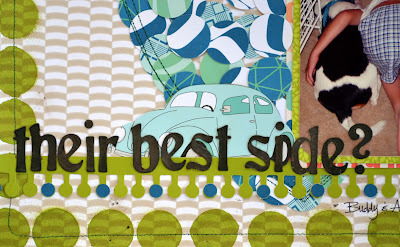 Today I am here to share today one of my favorite ways to use border strips! 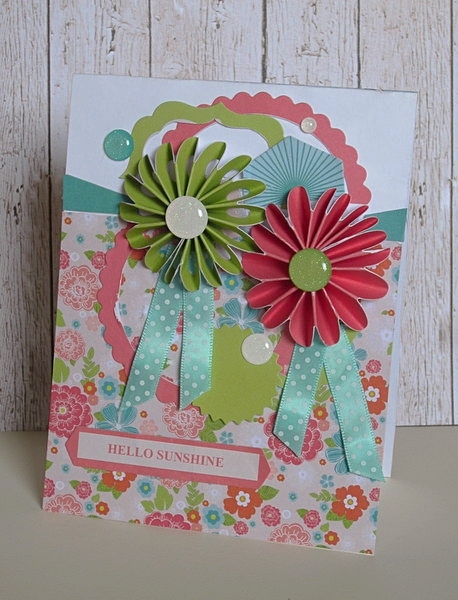 Bet you are looking at my card right now and wondering where in the world the border strips are...I love to take them and fold them into medallion flowers creating unique flowers. I used two different scallop borders to create these ones and as you can see they have a slightly different look from your perfectly round medallion flowers. So the next time you pick up a border, stop and think if there is an out of the box way you can use it! Hello everyone! 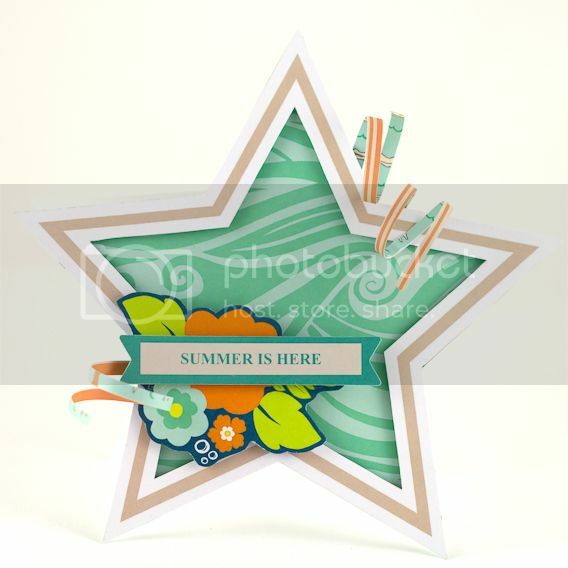 Nina here with a star shaped card for summer! 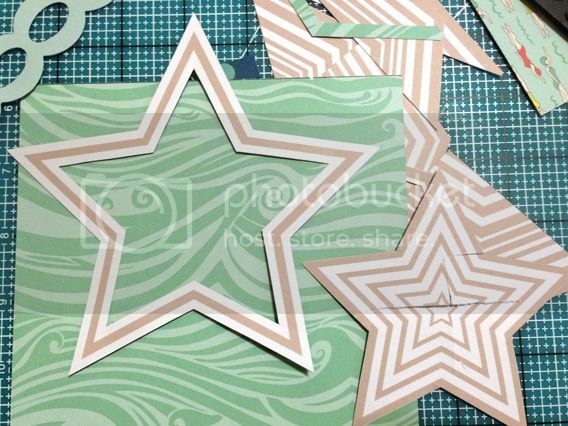 My favorite paper in the pad is the nesting stars / wave. 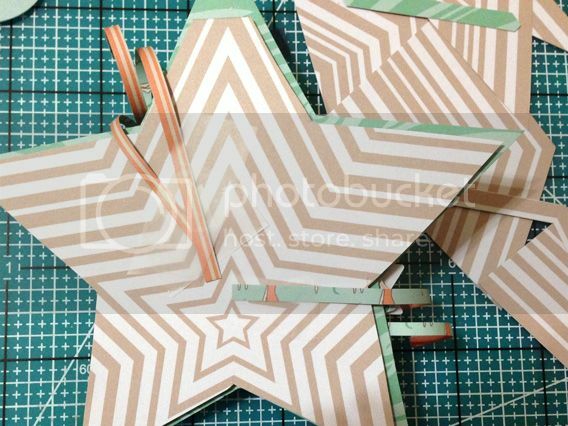 The 6x6 star paper is perfect for a shaped card. I started by cutting the center out to create a cool negative space for the wave pattern to show through. I then curled some scrap from the swimming girl paper to create some fun dimension for the card. Attached to the back with scotch tape. The floral cluster was cut out from paper in the same pad. 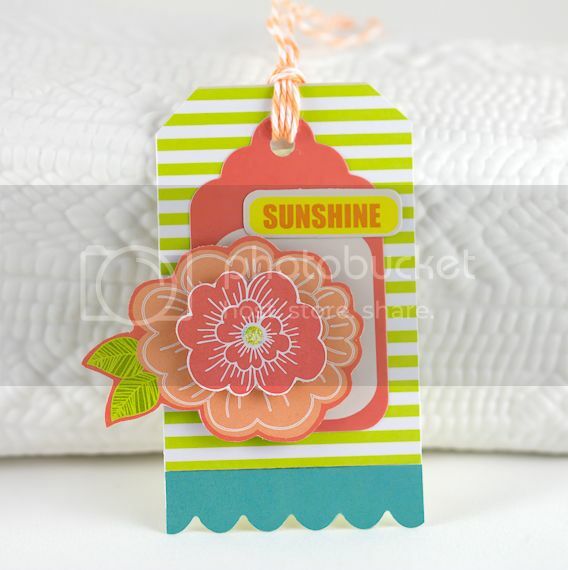 And I picked the perfect sentiment from the Sunkissed Label sticker sheet to finish my card. 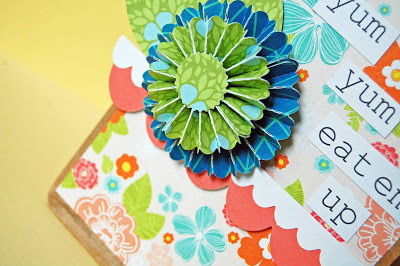 It got me to make a birthday card using my summer inspiration! 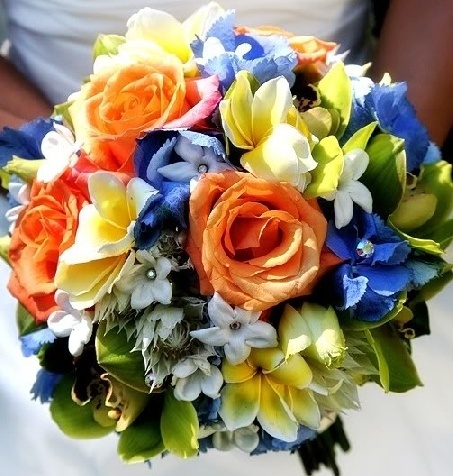 Oh the things I would do again if I only had Pinterest to help me with my wedding! I hope you are enjoying your summer!